It’s all too easy to find out your email and passwords have been included in a breach, so if your browser can tell you, wouldn’t it be useful? This week saw Safer Internet Day, a day that celebrates just that — staying safe on the internet — and while the theme this year was more about responsibility and respect as a digital citizen on the internet, making sure your passwords are secure is one of the better ways to stay safe on the web. These days, a website is breached all too regularly, and often, that means the accounts and passwords that go with that website are dumped and released to the web. If you’ve ever received a notification telling you to reset your password because of a security issue or a website that has been compromised, you know all too well what this means, and while it can be a bit of an inconvenience, it’s all to help you stay a little bit secure. However not every website sends an alert, and sometimes those that do will see it end up in spam. So how do you know if your email and password have potentially been compromised? Users of Google’s Chrome web browser have another way from this week, with a Google-made add-on that will tell you and help you to reset it if the account is at risk. 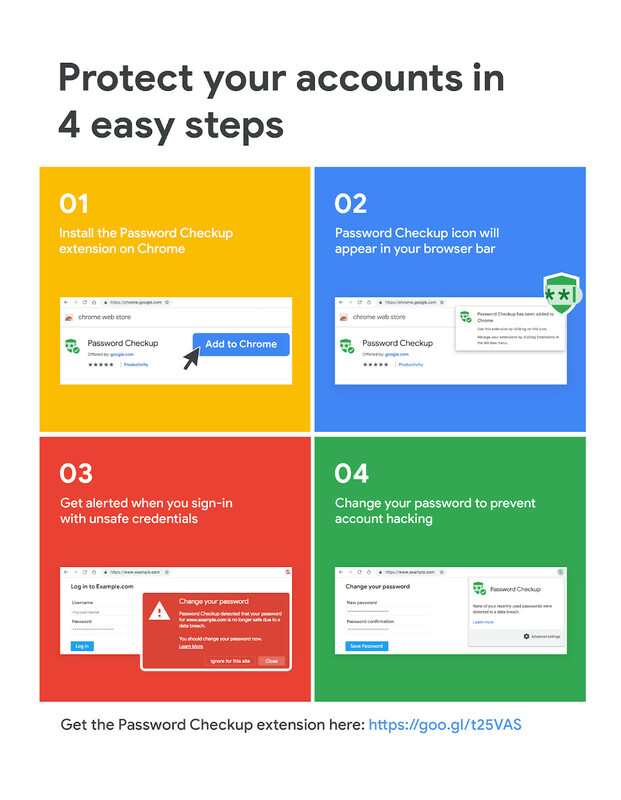 It’s an extension Google calls “Password Checkup” that will trigger a warning if the username and password you’re using to login to a website is known to be unsafe thanks to one of the many breaches accounts and passwords have had. The add-on was designed by Google and cryptography experts at Stanford University in America to keep your information away from Google and anyone else, but still check it using encrypted measures to make sure you’re aware of the possibility that an account you’re using with the password you’re also using is a liability. Google’s extension doesn’t just act as a warning system, offering an option to help you reset that password if it has been compromised. There’s a good amount of technical knowledge on Google’s website about how Password Checkup” works, but for the most part, it seems like a solid idea for all Chrome users to have, especially anyone concerned about the possibility that their old and still used account details could be out there being used. It’s a frustrating side of using the web, but password breaches are unlikely to go away for quite some time, if ever, so making sure you have something to check if passwords are as secure as they need to be is one way your digital life can be helped. Chrome’s extension can be added at this link.